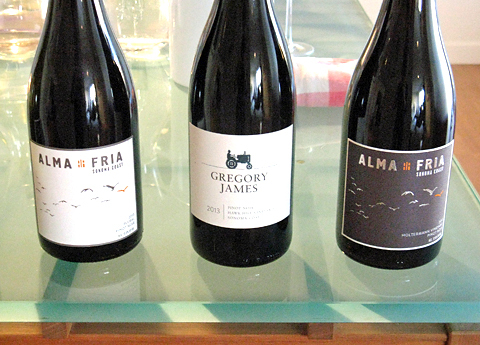 I attended a tasting in the ongoing Winemaker Salon series in mid-May, this one showcasing the wines of Alma Fria and Gregory James. Winemaker Salon was founded in 2015 by Cynthia Hogan, formerly the wine buyer for Canyon Market in San Francisco. 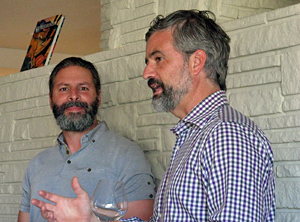 The tastings bring together winemakers and small groups of wine lovers at various private homes in the San Francisco Bay Area for special evenings that combine good wine, food, and company. These gatherings provide opportunities not only to sample a number of fine wines, but to learn about the vineyards and the people involved in the process in a relaxed and intimate setting. Focusing on small-production, high-quality producers – often newer and lesser-known ones – Winemaker Salon is a great idea, and it sounds like it’s been a big success so far. 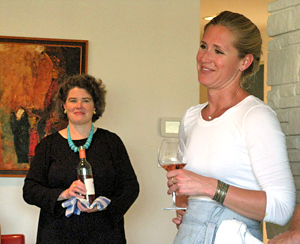 This Winemaker Salon tasting was graciously hosted by Laurette Foggini at her home in the Pacific Heights neighborhood of San Francisco. Winery proprietors Jan Holtermann of Alma Fria and Greg Adams of Gregory James were on hand to pour their most recent releases, and Chefs Anne Olson and Brooke Lewy presented tasty bites that they’d prepared to go with each wine we’d be tasting. Gregory James 2015 Rosé, Sonoma Coast. Light salmon color, this featured watermelon and strawberry fruit along with undertones of flowers, fresh herbs, and earth. Medium-light weight on the palate with zippy acidity and a clean finish. Gregory James 2014 Chardonnay, Patient Terrier Vineyard, Sonoma Coast. Light straw/yellow color, with bright citrus, spice, and minerally saline aromas plus floral and earthy notes in the background. Medium-bodied with vibrant acidity and a long, fresh finish that brought out the saline component. Alma Fria 2014 Chardonnay, Campbell Ranch, Sonoma Coast. Slightly deeper color than the previous wine, this had citrus and stone fruit on the nose with a distinct element of salinity, plus light touches of spice and vanilla/oak. Moderately rich and creamy mouthfeel with a lively texture and finish. Gregory James 2013 Pinot Noir, Hawk Hill Vineyard, Sonoma Coast. Medium-light ruby color, with upfront floral and fresh red fruit aromas with tea leaf and savory/meaty qualities in support. Medium-bodied with a lively, elegant texture and fine tannins on the finish. Alma Fria 2013 “Plural” Pinot Noir, Sonoma Coast. Medium-light ruby, this was less fruit-forward than the previous wine, showing more earth, spice, and a savory herbal note along with bright cherry and strawberry fruit. Medium weight with good body along with balancing acidity and moderate tannins. Alma Fria 2013 Pinot Noir, Holtermann Vineyard, Sonoma Coast. Medium-light ruby color, displaying black cherry, earth, fresh herbs, a hint of flowers, plus a savory note. A bit richer texture and bigger structure than the previous wine, with a stony mineral quality and refined tannins on the long finish. I’d first tried wines from both Alma Fria and Gregory James in the past couple of years at the West of West Wine Festival, held by the West Sonoma Coast Vintners organization to promote wines from that region. The western part of the Sonoma Coast AVA – sometimes referred to as the “true” or “extreme” Sonoma Coast – is a very distinctive cooler-climate growing area that includes Annapolis, Fort Ross-Seaview, Occidental, Freestone, Green Valley, and the Sebastopol Hills. This year’s West of West tasting was scheduled to be held the day after the Winemaker Salon, and since I had a conflict and would not be able to attend it, this provided a perfect opportunity to try new releases from these two up-and-coming Sonoma Coast wineries. As with an earlier Winemaker Salon I attended, there was a refreshing Cava for everyone to enjoy while the group got to know one another. Once everyone had arrived, we assembled in the living room to get the tasting started. Cynthia had provided everyone with a program listing all of the wines – including detailed descriptions – and the food being served to accompany them. She also had small clipboards with pens for everyone, which made it easy to take notes during the tasting. Cynthia got things started by introducing Greg and Jan to the group. Greg told us a little about himself – a native Californian, he grew up in Sonoma County and earned a master’s degree in viticulture from UC Davis with concurrent studies in enology. He’s worked in the wine business for about 25 years, spending six years in the Mendoza region of Argentina working to develop vineyards before returning to California, where he worked with Stag's Leap Wine Cellars in Napa and then Flowers Vineyard and Winery on the Sonoma Coast. He’s become a highly-regarded viticulturist in western Sonoma County, with his own consulting business called Beyond the Vine – he’s worked with Patz & Hall, Lynmar, Red Car, and Freeman among others, and he currently manages about 150 acres of vineyards. Greg is also the viticulturist and winemaker for Baker Lane Vineyards. Greg and his friend, construction site developer Jim Demuth, formed the Gregory James label a few years ago, with the first releases coming from the 2013 vintage. Vineyard sources are mainly in the cool Sebastopol, Freestone, and Occidental areas, and the winery produces Chardonnay, Pinot Noir, and a Syrah rosé. Current annual production is only around 1,000 cases, with most wines made in 100- to 200-case lots. Jan continued with his story. The Holtermann family has been known for its wine import business for three generations. Jan’s grandfather moved from Norway in the 1940s, settling in Costa Rica. Jan was born and raised there, and learned much about wine both from his family and from visiting vintners when he was growing up. After attending college in the US, he returned home and worked in his family’s import business for about 20 years before moving with his wife and daughters to Healdsburg in 2011, looking to acquire his own vineyard land and start his own winery. Jan launched the Alma Fria label in 2011, and in 2012 he purchased a 2.5-acre vineyard just north of Annapolis that was planted in 2002 to Chardonnay and Pinot Noir – this is now the estate Holtermann Vineyard. Alma Fria also sources fruit from Marimar Estate’s Doña Margarita Vineyard between Freestone and Occidental, and from other vineyards as well. Greg Adams is the viticulturist and Red Car’s Carroll Kemp makes the wines. Alma Fria is working on an exciting new vineyard project, a five-acre site along Occidental’s Taylor Lane, where some of the Sonoma Coast’s most famed vineyards are located (Summa, Thieriot, etc.). Greg planted the rootstock last year, and the vineyard will be planted to 50% each Chardonnay and Pinot Noir, with the first harvest expected in 2019. Current annual production of Alma Fria wines – all Chardonnay and Pinot Noir – is about 900 cases. We started out the tasting with a 2015 Rosé from Gregory James. Made from Syrah fruit specifically grown and picked early for this wine, the fruit was whole-cluster pressed and fermented in neutral oak. Some batonnage and partial malolactic fermentation helped give this wine added body to go with its brisk acidity. Prosciutto-wrapped melon with fresh basil accompanied the Rosé, playing on the melon and herb aromatic notes of the wine. Next up were two 2014 Chardonnays, beginning with the Gregory James bottling from Patient Terrier Vineyard. Greg told us he helped plant this site about eight years ago with three California heritage selections of Chardonnay – Robert Young, Spring Mountain, and Old Wente. Whole-cluster pressed and fermented in neutral oak, this had a mildly creamy texture and a distinctive saline note that worked very nicely with raw oysters with mignonette. The Alma Fria Chardonnay was sourced from Campbell Ranch, just a few miles from the Holtermann Vineyard in the Annapolis area, and planted in 2005 to the Old Wente selection. Jan told us that our this was the debut public tasting of this wine, his first single-vineyard designate Chardonnay. A bit richer than the Gregory James Chardonnay and with a touch of new oak, but displaying a similar and unmistakable element of salinity in the aromas, a second oyster preparation – broiled with butter-garlic breadcrumbs – was a fine match. We moved on to a pair of 2013 Pinot Noirs next, comparing wines from each vintner with the same accompaniment, chicken liver mousse on crostini with strawberry-rosemary compote, using the earthiness of the dish to work well with the two wines. The 2013 is the first vintage of Hawk Hill Pinot for Gregory James. The fruit was almost entirely destemmed (only 2-3% whole cluster) and underwent a long cold soak before fermenting in small stainless steel tanks. The fresh red fruit aromas combined with floral and herbal notes were quite appealing. The Alma Fria “Plural” Pinot was sourced from four vineyards – Holtermann, Doña Margarita, and two more sites near Freestone. This was made with about 10% stems added back into the fermentation. With less upfront fruit than the Gregory James Pinot, this displayed more earth and spice along with a bit more weight on the palate. Both wines featured a savory element that worked nicely with the food. Finishing up the tasting was one more 2013 Alma Fria Pinot Noir, this one from Holtermann Vineyard. From four Pinot clones – Pommard, 115, 777, and 828 – this was made in a similar way to the “Plural” bottling but with a little more new French oak, about 20% of the total. Earthy, herbal, and a bit floral with a richer texture, this was a good match with porcini-crusted lamb with rosemary-infused white beans. It’s worth noting that the alcohol levels of the wines we tasted were quite modest, ranging from 11.9% for the Gregory James Rosé to 13.3% for the Alma Fria Chardonnay. Yet I never got the sense that lower alcohol in and of itself was the goal for any of these wines, and they all displayed beautiful depth and complexity of aromas and flavors along with balanced acidity. It was tough for me to pick favorites out of the six wines we tasted – they were impressive across the board. But I’d say the Gregory James 2014 Patient Terrier Vineyard Chardonnay and the Alma Fria 2013 Holtermann Vineyard Pinot Noir just edged out the others. This was my second time at a Winemaker Salon tasting, and I’m sure it won’t be my last, as Cynthia continues to schedule some terrific vintners to present their wines at her events. Each time it’s really felt like an informal gathering at a friend’s home to enjoy a relaxing evening. I know that creating that sort of atmosphere is not an easy task to pull off, so congrats to Cynthia and thanks to Laurette for opening her home to us. Thanks too to Anne and Brooke for the delicious and carefully thought-out food pairings, and thanks of course to Jan and to Greg for pouring us their wines. A fun evening, and it’s worth checking out Winemaker Salon to attend future tastings.